Raising questions about the definition of a vegetative state as well as what to do with people in them, a new study observed the brain of an unconscious patient responding to yes and no questions just like normal. Of the 54 test subjects in the New England Journal of Medicine study, one man who had been diagnosed as being in a vegetative state some five years earlier accurately answered yes or no questions. The answers came by way of a brain scan conducted by an MRI machine. 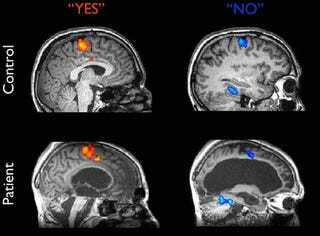 As shown in the image above, answering "yes" and "no" registers activity in different parts of the brain. When the patient was asked if his father's name was Thomas, the scan showed his brain indicating "no." When asked if his father's name was Alexander, the scan showed the correct answer of "yes."